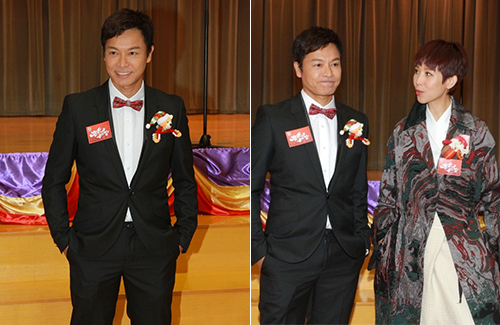 Roger Kwok (郭晉安) and Ada Choi (蔡少芬) aren’t finished with each other yet. The Oh My Grad <老表，畢業喇！> actors, who were seen shooting a scene for the upcoming drama in Kowloon Bay on Thursday, are already talking about working together again in future projects. Oh My Grad—the third installment to Wong Cho-lam’s (王祖藍) Inbound Troubles series <老表系列>, is Roger and Ada’s first collaboration since TVB’s two-part epic At the Threshold of an Era <創世紀> in 1999. Oh My Grad has one more month left before filming wraps up. Roger remarked that he has great chemistry with Ada on the show. Though rewrites and script changes were common, Ada’s diligence brought the cast back on track. “We always get off work in time when she’s around,” said Roger. In August, TVB announced plans to produce Threshold Again <再創世紀>, a sequel to At the Threshold of an Era. The drama is currently in pre-production. Roger, who starred in the original series with Ada and Gallen Lo (羅嘉良), said he was courted for a role, but plans have not been finalized yet. I love the way how Roger dress up it looks real good on him and the tiny bear are so cute. Looking forward to Oh My Grad because of Roger-Ada pairing. Luckily WCL managed to get Ada to replace Joey for this series…definitely a good replacement. I do wish both Roger & Ada could work together again for Threshold Again since they were among the original casts for the series last time. If TVB is not planning to get Gallen Lo to lead the new series…then Roger or Wayne should be given the priority to be the lead…or both of them co-lead the series. I have high expectation for Threshold Again since i was so in love with the original series…so i hope TVB would not ruin the new sequel with bad casting & storyline. @diana80 Not sure about the quality of Oh My Grad, dropped the second installment after catching it here and there. But do agree that casting Ada is a good choice, she is one of the very few TVB actresses who have good comedic timing. Though I love Joey in My Date with a Vampire, don’t think she suits comedy. As for Threshold, didn’t fancy the original nor Gallen but if the story is good and the cast is good, it is always a big welcome to have a new story. Agree on the drop of quality for the second installment. Therefore, if it is still Roger-Joey for the third series, I would not be keen to watch since i know that the comedy is a bit try hard. But with the fresh pairing of Roger-Ada, i’ll give it another try. Love Roger! Looks good in a suit! Ada rocks in comedy so will be looking forward to this.